A logo is a perspicuous glyph or symbolic, identifying mark that conveys origin, identity, or ownership. The main function is to elicit recognition. We design conceptual logo & brochure which is the core of corporate identity, defining and symbolizing the character of the company or organization. We are ranked on top by offering the best quality of Corporate Brochures. BrandSTIK is proud to introduce a radical new technology where print meets video, in one the most exclusive and innovative promotional product in the world. 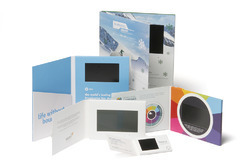 video Brochures , video brochure cards for corporate product promotions, gift to clients, corporate presentations. ALSO BEING USED IN WEDDING CARDS AND BOXES. For storing and gifting very personal memories . digital video brochure, video business card brochure, video brochure for jewellery boxes. Brochure with video screen. Business brochures printing online at best quality. Multi-color printing of folded leaflets. Video Brochure is an innovative marketing tool that combines the power of high-resolution video with the precision of direct mail, video brochures deliver highly impactful and effective marketing campaigns that get your message in front of key customers in an extremely engaging and memorable way. PCB boards, speakers and rechargeable lithium batteries.